NEW CONCENTRATED ANTI-SMEAR FORMULA LEAVES WINDSCREENS CLEAR AND FROST FREE FOR SAFER DRIVING. Use to unfreeze lock mechanisms. Powerful jet spray to reach truck windscreens. Free from methanol. Will not damage body work, rubber, PVC or glass. Ozone friendly. Does not contain chlorofluorocarbons. 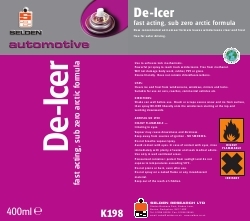 Clears ice and frost from windscreens, windows, mirrors and locks. Suitable for use on cars, coaches, commercial vehicles etc. Shake can well before use. Brush or scrape excess snow and ice from surface, then spray DE-ICER liberally onto the windscreen starting at the top and working downwards. N.B. Not to be used inside vehicles.